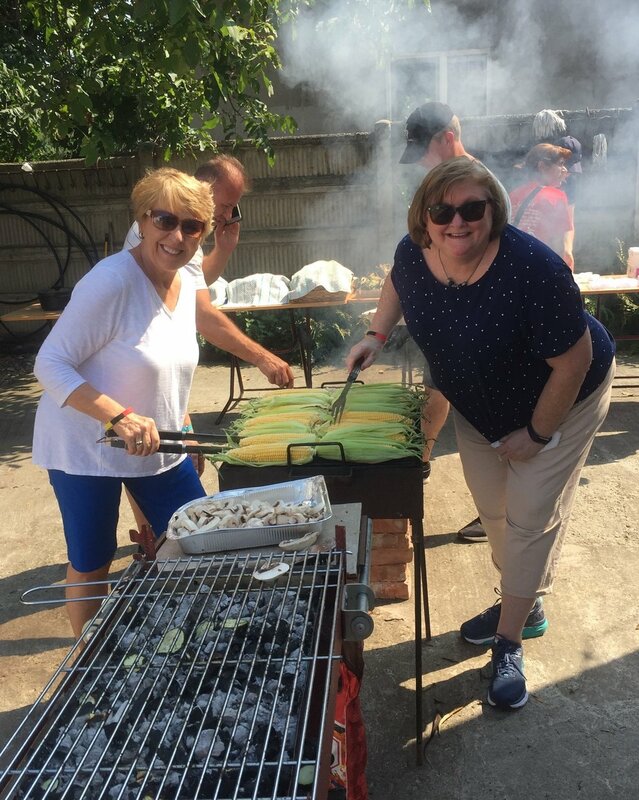 Our trip to Romania began with a wonderful time of fellowship and outreach. We helped Harmony church put on a picnic to bring together members of the community, believers and non-believers. Before the picnic, our team built four picnic tables, and of course we all helped prepare the delicious menu of barbecued ribs and chicken, fresh corn, delicious Romanian cole-slaw, home grown fruits and veggies, and yummy, homemade sweet treats. We were privileged to share testimonies and visit with our guests. We pray that our message of God’s faithfulness and his power to transform gave hope and encouragement. Our team was also blessed to worship alongside our Romanian brothers and sisters in Christ. We were honored to encourage these church bodies by sharing our testimonies with them. Vacation Bible School was a blast! Throughout the week, two of our team members have tirelessly aided and encouraged local hospice nurses. They held a two day seminar to share palliative care methods and accompanied the nurses on home visits. We were all humbled to hear about how these Romanian hospice nurses doe so much with so little. Not only do they care for the physical needs of the patients, but they also tend to the spiritual needs of the patients and families, through prayer, love, and encouragement. Meanwhile, our food distribution team visited fellow Christians who are homebound due to chronic illness. They sought to offer encouragement and care, hoping to provide physical and spiritual sustenance. The whole team had a wonderful experience visiting the orphanage in Blaj. The parents of these children brought them to the orphanage because either they cannot or will not care for the child any longer. Even in the midst of these heartbreaking circumstances, the Lord provided us with abundant joy as we played and spent time with the children. Please join us in continued prayer for them. We are so thankful for our opportunity to share Kingdom work with our ministry friends in Romania. We ask God to use all that we said and did for His continued glory.